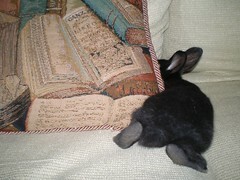 Soot Sprite is a friendly, curious and adventurous rabbit. He and his siblings were rescued in Plymouth, MA at four weeks of age. Even then, Sprite exhibited a keen desire to explore. He’s an impressive jumper and needs a cage with a ceiling as opposed to an open pen. 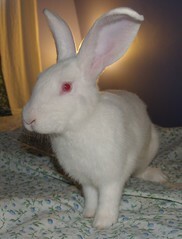 HIs gregarious attitude and lack of territorial behavior around new rabbits leads to the suspicion that he would be a good bonding candidate. He’s still young and as a result his litter habits are still evolving. He still tends to leave a few stray pellets outside his litter box. Hank Morgan, AKA "The Boss"
Hank was among four baby rabbits found roaming in Plymouth. He’s known as “The Boss” in his foster home due to being the largest of his litter, and the definitive leader of the group. Boss is friendly and curious. While he can be held he’s very squirmy due to his tendency to explore his surroundings. When upset or frustrated he will sometimes take your finger in his teeth. This is not a bite by any means, but his way of politely telling you he wants some romp time. 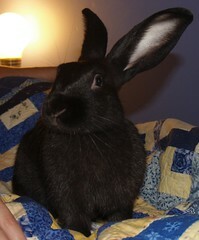 Boss, like his siblings, tends to be very easygoing about other rabbits. He’s more curious than anything else and is expected to be a good bonding candidate. Being young his litter box habits are maturing as he still leaves a few pellets where he ought not, but this has been improving over time. This is an old photo of either Soot Sprite or Samson. You can’t really tell from the rear view. The babies were about four or five weeks old when this was taken. Weighing in at around 11 to 13 ounces each, they now weigh 5 to 6 pounds each.